The GALA (Indoor) event (Feb 14th, 2015) will showcase fabulous performance we have enjoyed in Tampa Bay year after year, celebrating the joy of Life, the wonders of Love (Valentine’s day) and the beauty of Chinese culture. * For detailed information please contact any CAAT board of directors. The Festival (outdoor) will showcase the new adventure of what we bring to Tampa Bay residents to celebrate the unity of Chinese New Year. 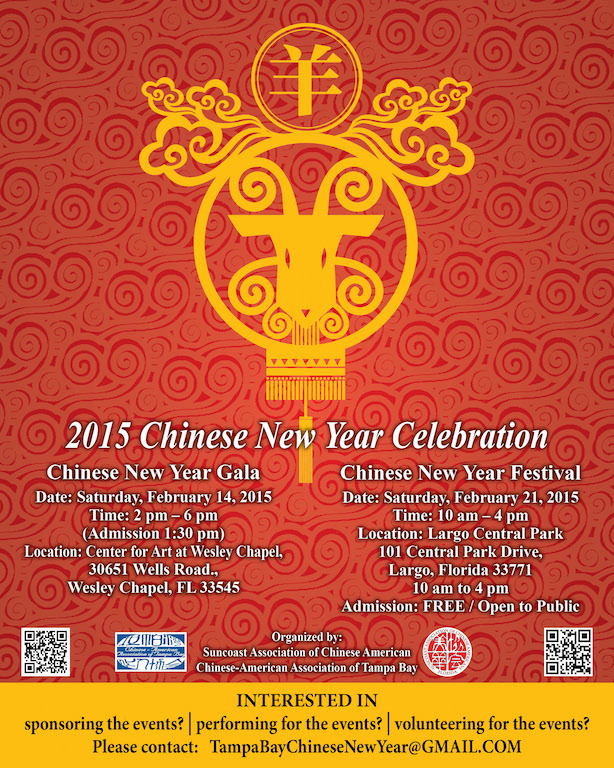 This will be the 3rd year of CNY outdoor festival here in the Tampa Bay Community. 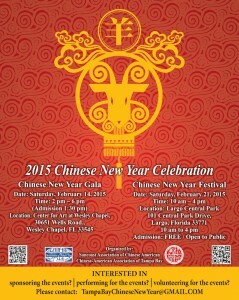 Feb. 21st, 2015 together we will celebrate the Journey back to Chinese New Year and Mark the change of what Tampa Bay Chinese New Year Festival will be. * FREE blood glucose, cholesterol, and blood pressure screenings, bone marrow drive and health information by USF Asian Pacific American Medical Student Association (APAMSA). * For detailed information please contact any SACA board of directors. Special thanks for all the board of directors, schools, churches, clubs, community leaders and volunteers for their year round of hard work. As you can tell SACA & CAAT board of directors are working very hard to showcase Chinese New Year Festival here in Tampa Bay. We invite everyone to come to our events and we encourage every member to help us promote these awesome events. We wish everyone a happy, joyful and prosperous new year.